Hot As Hades is turning up the heat in an already hot summer with scorching reels as you follow the escapades of an impish little devil climbing Mount Olympus. 20 pay lines across this five reel slot release from one of the absolutely undisputed top developers for online casinos, Microgaming is already a great sounding game, knowing that the creative team there always turns out their very best for the players. Add to that the random chance for 5 Free Spins to be triggered as well as score multipliers and more on top of an amazingly animated and visually exciting display and a fun story and you've got a slot that will burn a hole in your pocket. Land three Scatter symbols or more and the Quest For The Crystal Helm bonus mode sets off, leading you toward the end of the journey and, more importantly, towards increasingly massive jackpots that can scale all the way up to 100,000! Slog your way up that mountain looking for the coveted crown and tag the route with big wins and laughs as funny and amusing 3D animations play out with different symbol combinations. 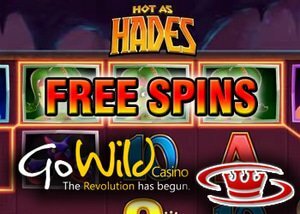 Head over to Go Wild Casino now where the game is being featured and celebrated by rewarding players willing to fire up Hot As Hades with a veritable mountain of cool new electronic gadgets! Right through August 2, 2015, every $50 wagered on the game will earn players a new raffle ticket toward the draw which will see five lucky winners taking away shiny new toys as well as their winnings from playing the game itself. As an additional draw to try this new and amazing game at GoWild, welcome packages containing Free Spins as well as 500 and 2000 Loyalty Points that can be redeemed on the site await those who start out with new registrations. Head over to the online casino to spin, play, win, and collect your rewards and chances to win fantastic prizes of cash and gadgets.